"Jamestown College" redirects here. For the college in Jamestown New York, see Jamestown Community College. 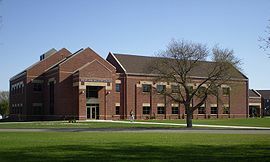 The University of Jamestown is a private liberal arts college founded by the Presbyterian Church located in Jamestown, North Dakota, United States. It has about 1,000 students enrolled today and has been co-educational from its founding. Until August 2013, the school was known as Jamestown College. In 2007, Jamestown became the first North Dakota college or university to make US News and World Report's "Tier 1" for undergraduate colleges in the Midwest, a distinction repeated annually ever since. As of 2018, the University of Jamestown ranks 29th in the Midwest. The University of Jamestown was founded as Jamestown College in 1883, but closed fairly quickly during the depression of 1893. The school reopened in 1909 and has remained in operation ever since. In 1979, Jamestown College's football team went to the NAIA Division II National Championships. Two graduates of the institution have become Rhodes Scholars. In 2013, in light of a new master's program and applied doctorate degree program, Jamestown College changed its name to the University of Jamestown. In 2018, Dr. Robert Badal retired from his position as university president after serving in the role for nearly 16 years. He was succeeded by Dr. Polly Peterson. The University of Jamestown athletic teams, nicknamed the Jimmies, are part of the National Association of Intercollegiate Athletics (NAIA), primarily competing in the Great Plains Athletic Conference(GPAC) since the 2018–19 school year. The Jimmies formerly competed in the North Star Athletic Association, the now-defunct Dakota Athletic Conference (DAC), as well as an Independent of the Association of Independent Institutions (AII). Starting in 2016–17 The University of Jamestown introduced a men's ice hockey team that competes in the American Collegiate Hockey Association Division 1 (ACHA). Men's sports include hockey, baseball, basketball, cross country, football, golf, soccer, track and field, volleyball and wrestling; while women's sports include basketball, cross country, golf, soccer, softball, track & field, volleyball and wrestling. The University also boasts a co-ed eSports team. ^ a b c d "University of Jamestown - Best Colleges - Education - US News and World Report". USNews.com. US News and World Report. Retrieved 2018-10-24. ^ "Our History". University of Jamestown. Retrieved February 16, 2012. ^ a b "Jamestown College is now University of Jamestown" (Press release). University of Jamestown. August 21, 2013. Archived from the original on 2013-10-22. Retrieved 2013-08-21. ^ "US News and World Report moves Jamestown College to top tier". University of Jamestown. 2007-08-17. Archived from the original on 2011-05-25. Retrieved 2007-10-31. ^ "NAIA Football Championship History" (PDF). naia.org. National Association of Intercollegiate Athletics. 2008-01-03. Archived from the original (PDF) on 2008-10-29. Retrieved 2008-07-17. ^ "Rhodes Scholarships: Number of Winners by Institution" (PDF). U.S. Rhodes Scholarships: Number of Winners by Institution, U.S. Rhodes Scholars 1904 – 2018. ^ Keith Norman, University of Jamestown president to retire, West Fargo Pioneer (February 16, 2018). ^ Fairbanks, Katies. "UJ starting up eSports team". The Jamestown Sun. Retrieved April 3, 2017. ^ Shapiro, T. Rees (2017-06-03). "George W. Johnson, college president who transformed GMU, dies at 88". Washington Post. Retrieved 2017-06-24.